Piers were an ideal location for walking picture cameramen; a captive audience and people keen to have a holiday souvenir. Skegness Pier was a typical tourist attraction. Opened in 1881, with concert-hall and refreshment rooms at the seaward end of the 1,800 foot long structure. Visitor numbers were already around 8,000 a week after just a year of opening but in 1889 20,000 people visited on one August day. 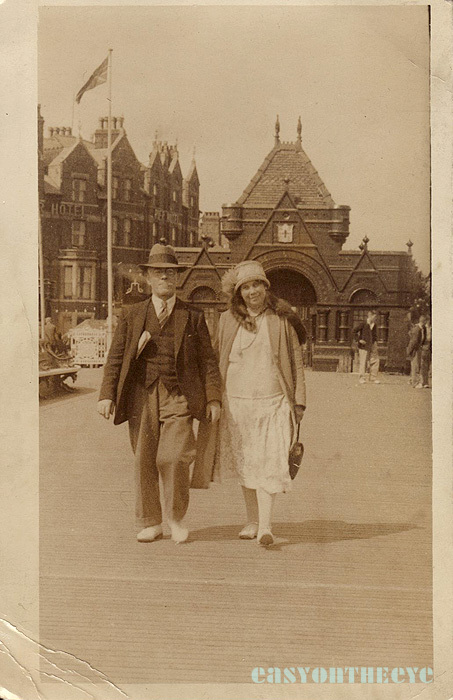 The madly gothic entrance structure and ticket office survived until the late 1930s, and pier snaps were collected from a kiosk in front of the entrance steps. It’s difficult to know which firm took the earlier pier snaps, the three examples I’ve seen (two shown on this page) are unmarked. 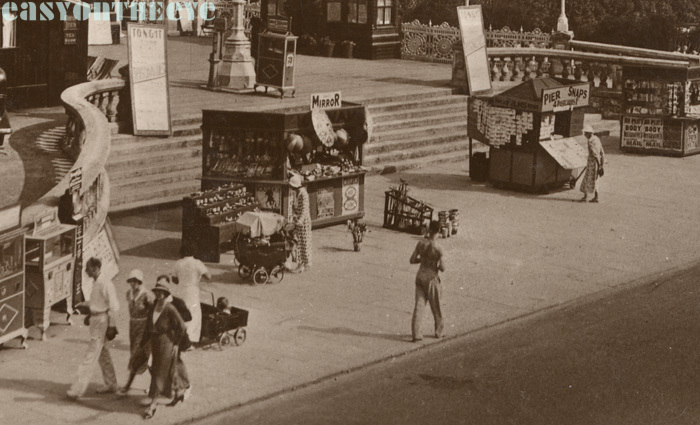 This image shows – on the right – the “Pier Snaps” kiosk (which seems to be on wheels), one side covered in walkies waiting to be collected (and a prospective customer studying the cards). Note the price – 4 postcards 1/-. The first walkie card was sent by Brian Sylvester; unmarked it clearly shows the pier entrance with the old Pier Hotel in the background (destroyed by fire in the 1960s). The second walkie was taken further out on the pier looking back at the town and looks slightly later. Again it is unmarked. 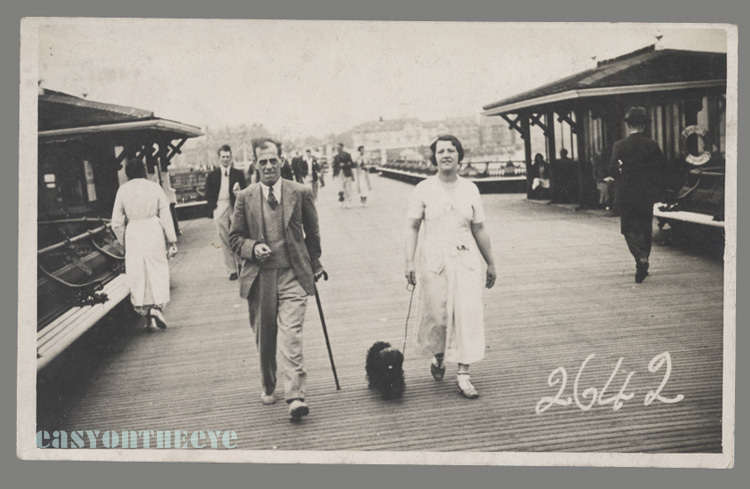 In 1936 the original pier entrance was demolished and by 1939 a brand new art deco structure – the Pier Pavilion – was in place. This incorporated shops on either side of the entrance, with the walking picture firm of Wrate’s Snaps occupying one side. Despite this, we’ve still no evidence they took photographs on the pier itself. 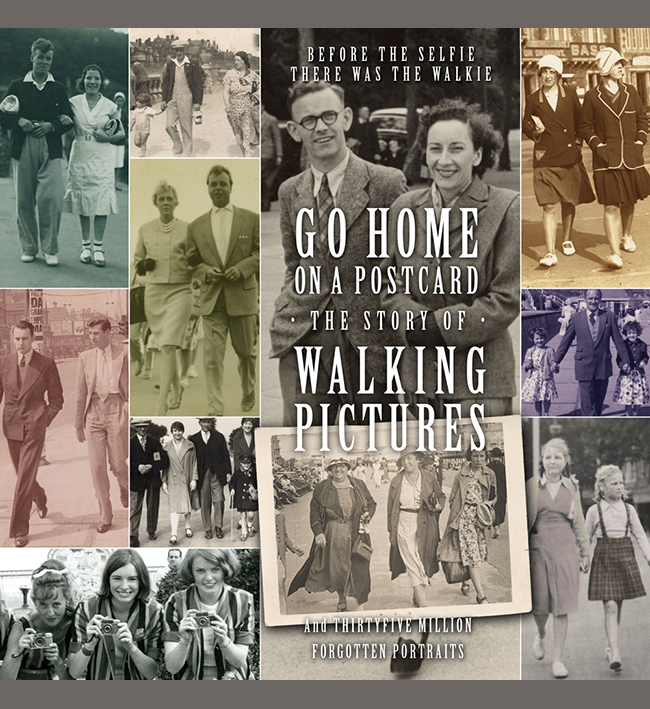 ; possibly this was just a suitably prominent position for them to sell the walkies taken on the seafront area. One Wrate’s walkie I’ve seen has a “Piersnaps” logo on the back, even though the photo itself was taken in town. The landward end of the pier was roofed over in 1949 to form an arcade. Some time in the 1960s the deco entrance was given listed building status but this didn’t stop the owners demolishing it in 1970 (claiming not to know of the listing! ), replacing it with a tacky plastic and glass clad structure which remains today. The rest of the pier beyond the arcade suffered damage and fires and what was left was eventually demolished in the 1980s, though a small new pier has been reinstated. Click here for a Wrates Skegness walkie in wallet.